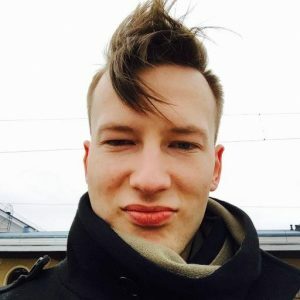 Godra ransomware uses sophisticated techniques to infiltrate computers and hide from its victims. Use Reimage to determine whether your system is infected and prevent the loss of your files. Godra is a file-encrypting virus that has been noticed spreading in Croatia, in December 2017. Malware affects Windows x64 systems and uses AES cryptography to corrupt files on the targeted device. After the attack, all data is locked with .godra file extension. The .log file is responsible for delivering a pop-up notification that informs about data encryption and asks to send an email to godra@protonmail.com. Meanwhile, the .txt file includes a detailed explanation that users have to transfer 2.000 euros in 48 hours to restore files encrypted by Godra virus. Data recovery instructions also include the link to the Bitcoin wallet address where victims are supposed to send ransoms and unique ID number. Once people make a transaction, they are asked to contact developers of Godra and provide their identification number via mentioned email address. However, if victims do not pay in two days, the size of the ransom will double. If crooks do not receive the payment within 72 hours, they will delete encrypted files, says the ransom note. In order to give victims guarantee that Godra decryptor exists, criminals allow sending one file (up to 100 KB) for a free decryption. However, security experts suggest not following these instructions because it may lead not only to data loss but money loss as well. Once you transfer the ransom, crooks might disappear and use your money for further cyber crimes. Instead of risking to increase the damage, you should remove Godra from the PC. After the attack, you should restart your computer to Safe Mode with Networking and run a full system scan with malware removal software. The reputable program such as Reimage can perform Godra removal quickly. 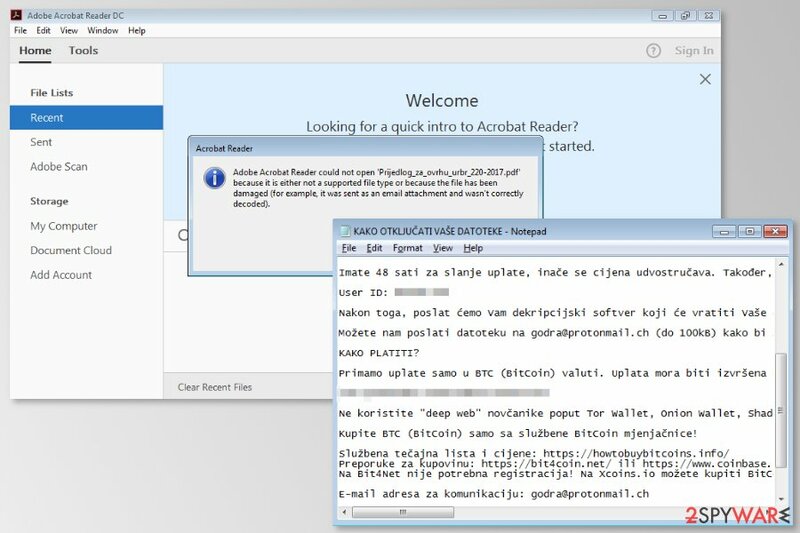 Godra ransomware targets Croatian computer users and demands 2.000 euros in exchange for data recovery software. Malware payload spreads as Prijedlog_za_ovrhu_urbr_220-2017.pdf file which is attached to the malicious email. The subject line of these emails are “Elektronička obavijest o pokretanju ovršnog postupka,” (translation to English: “Electronic Notice of Enforcement of Enforcement Procedure”) and they look like sent from Croatian Financial Agency (FINA). The company released an official statement on their website warning users and customers to be careful. All their sent emails have a domain name fina.hr. Thus, any other endings of the emails are sent by cyber criminals. However, users who open a malicious attachment, receive a notification from Adobe Acrobat Reader that it is unable to open this file. But opening this file is enough for ransomware to infiltrate the system. you do not use FINA's services. Therefore, before opening an email attachment, you have to check information about the sender online and make sure that it’s actually safe to open. To remove Godra from the device, you have to obtain reputable malware removal software. 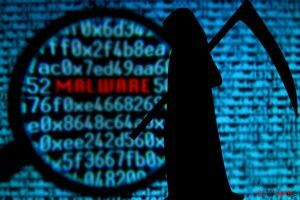 Trying to locate and delete ransomware-related components might lead to irreparable damage to the system. Thus, you have to use automatic virus removal tools. We recommend Reimage or Plumbytes Anti-MalwareMalwarebytes Malwarebytes for Godra removal. However, feel free to use your preferred software as well. However, don’t forget to update it before running a system scan! Additionally, if malware prevents from installing or running security tool, follow the guide below. Log in to your infected account and start the browser. Download Reimage or other legitimate anti-spyware program. Update it before a full system scan and remove malicious files that belong to your ransomware and complete Godra removal. When a new window shows up, click Next and select your restore point that is prior the infiltration of Godra. After doing that, click Next. Once you restore your system to a previous date, download and scan your computer with Reimage and make sure that Godra removal is performed successfully. Guide which is presented above is supposed to help you remove Godra from your computer. To recover your encrypted files, we recommend using a detailed guide prepared by 2-spyware.com security experts. Nevertheless, it's not an official decryption software; it might still help to recover some of the corrupted files. This Windows OS feature allows accessing saved files before Godra ransomware attack. However, it allows copying only individual files and under one condition – System Restore had to be enabled before the assault. The official Godra Decryptor is not available yet. ^ FINA UPOZORAVA NA POJAVU LAŽNIH ELEKTRONIČKIH PORUKA O POKRETANJU OVRŠNOG POSTUPKA TE POZIVA PRIMATELJE DA IH NE OTVARAJU. FINA. The official website. ^ Mark Brunelli. Five ways to detect a malicious 'phishing' email. Carbonite. The official Carbonite blog. This entry was posted on 2017-12-18 at 08:46 and is filed under Ransomware, Viruses. You can quickly scan the QR code with your mobile device and have Godra ransomware manual removal instructions right in your pocket. How did you remove Godra virus?